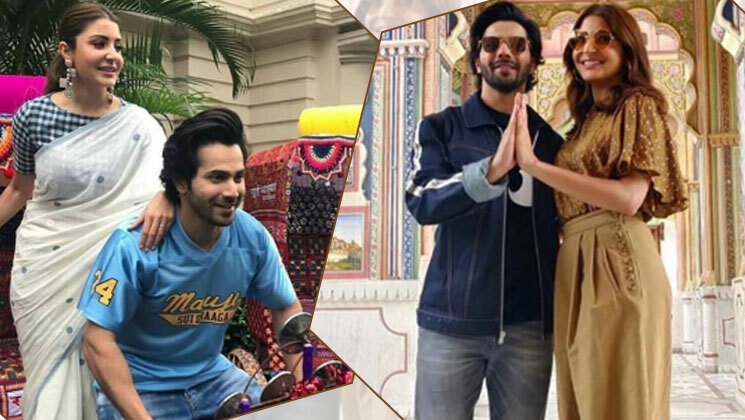 Bollywood actors Anushka Sharma and Varun Dhawan are busy with the promotions of their upcoming release ‘Sui Dhaaga’. The ‘Pari’ star has upped her fashion game while promoting the Sharat Kataria directorial. She has definitely set some major fashion goals for her fans. Anushka, who is playing the role of a small-town woman in the film, has played with not only traditional but also the latest fashion trends. Anushka Sharma was seen promoting her upcoming film ‘Sui Dhaaga’ dressed in an attired from her own brand Nush. The ‘Pari’ star looked bewitching in an olive coloured top which had long sleeves and a mosaic print all over. She had paired it with black pants and studded black bellies. The next number that caught our eye was during her Rajasthan promotions where she had donned a bandhani copper brown top from the label Koashee by Shubhita. It was teamed with a matching pair of wide legged trousers from Zara. She had accessorised it with shoes from Aquazzura and some gold earrings added a hint of shine. This striped two-piece set grabbed eyeballs of fashionistas. The long shirt and pants from Atsu and the barely-there accessories with her middle-parted hair gave Anushka a chic and classic look. Anushka managed to slay with her Denim on Denim look while promoting ‘Sui Dhaaga’. The ensemble was from her own label Nush and added a certain charm to Anushka’s look. She looked divine in a one-shouldered denim shirt and wide-legged jeans. 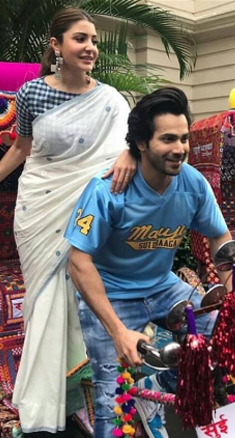 Anushka Sharma was glowing in a white Jamdani sari during the Kolkata promotions of ‘Sui Dhaaga’ with co-star Varun Dhawan. The Jamdani was paired with a blue and white chequered blouse to give it a contemporary touch, with her hair pulled back in a neat ponytail. She rounded off her look with a pair of quirky silver earrings. Anushka Sharma has truly nailed the art of dressing and this will set a new trend among her fans. Her choices are not only comfortable but chic too. Also Read: Our hearts are going to be forever stuck in Anushka Sharma’s jhumkas!